Flowering in most trees does not appear to be under photoperiodic control (Kozlowski et al., 1991). Mango cultivation is concentrated between 27° N and 27° S where the shortest annual photoperiod is c. 10.5 h and the longest photoperiod is c. 13.5 h. Cultivars in the upper-latitude tropics and subtropics flower during the winter when photoperiods are short; however, trees in the low-latitude tropics, where a 12-h photoperiod is nearly constant, can flower at any time of the year. Furthermore, flowering on spring-initiated shoots in the subtropics occurs during summer (Schaffer et al., 1994). Studies have failed to demonstrate a correlation between 8-h photoperiods and flowering (Maiti, 1971; Maiti and Sen, 1978; Maiti et al, 1978). Nunez-Elisea and Davenport (1995) studied the effects of 11-, 12-, 13- and 24-h photoperiods at 18°C day/10°C night, or 11- and 13-h photoperiods at 30°C day/25°C night on flowering of container-grown trees. Photoperiod had no effect on the fate of buds, and the promotive effect of cool temperatures on flowering was independent of photoperiod. Photoperiods of 11-, 12- or 13-h with 18°C day/10°C night, caused flowering in trees within 40 days. The 24-h photoperiod with 12-h thermoperiods of 18°C and 10°C caused flowering of trees within 35 days. Photoperiods of 11- or 13-h at 30°C day/25°C night resulted in vegetative growth only. With warm temperatures, vegetative shoots were produced in 17 days. These results confirm that floral induction is caused by cool temperatures and not by short photoperiods and that warm temperature, not a long photoperiod, caused vegetative induction. 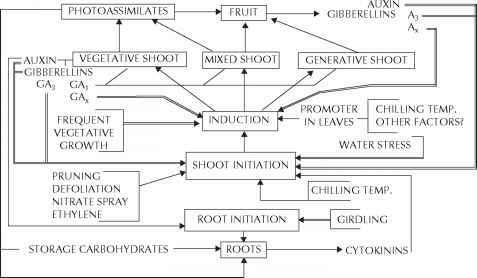 What is photoperiodism in fruit production? Why do fruits need long photo period?